Calvin and Hobbes is my favorite comic strip of all time. 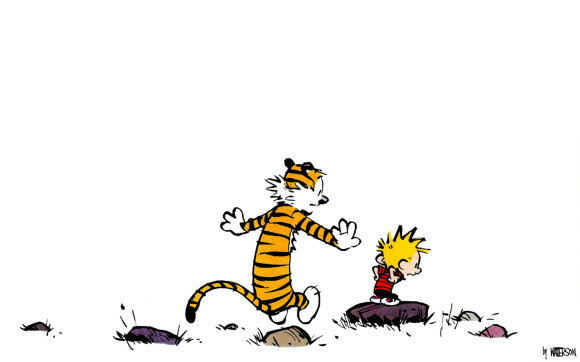 The adventures of Calvin and his stuffed animal Hobbes (that comes alive when nobody else is around) were just classic. A game the two played often was called ‘Calvinball.’ The central premise behind that game is that rules are made up as you go along. Ironically, that is the central premise of how Barack Obama operates as President of the United States. For a man who so badly wanted to be President, he seems to hate the job. It’s almost as if he imagined he would take office and have to do nothing other than say, “I’d like to do this” and it would magically happen. You took a teaching position, ’cause you thought it’d be fun, right? Thought you could have summer vacations off…and then you found out it was actually work…and that really bummed you out. That’s President Obama. He found out the job he was elected to do was actually going to require real work. That reality became more frustrating when Republicans took control of the House of Representatives. Liberals can whine all they want about the “intransigence” of the Republican party when it comes to working with President Obama. But the bottom line is, he’s the leader of the free world and it’s up to him to get people into a room and work things out. Instead, the President would fly around the country in perpetual campaign mode, giving speeches and wondering why John Boehner was not reaching for the fainting couch as the sound of his glorious oratory reached the Speaker’s ears. 1. When the President’s “jobs” bill was stalled in Congress. 4. In particularly ridiculous display of petulance, the President threatened to take action his own with respect to designating monuments. This list could go on for some time. This is how he behaves. Supporters will argue, “But the GOP gives him no choice!” That’s hogwash. When the President says, “If Congress won’t act…” he really means, “If Congress won’t do exactly what I want…” His hand puppet in the Senate, Harry Reid, acts accordingly and declares any legislation delivered from the House that does not conform to his masters wishes, dead on arrival. In addition the number of times the Obama administration has made changes to Obamacare on a whim, could take up an entire article. While the President didn’t get into specifics, he has been adamant that he wants an extension of unemployment benefits because the economy is doing so well. His attempts to extend UI benefits without authority from Congress may fall short, but that certainly does not mean he will not try. And why not? This is Calvinball!